As we all know Election Commission Of India issues Voter ID card to all Indian citizens. Now it is accepting complaints from possessor through online, here all citizens from India have a chance to register complaint related to Voter ID or any other. One can register complaint during Election/Non Election Period, mobile number holds high priority to register complaint. If you have any complaints (Related to Political party, Epic & Electoral Roll, Feedback & suggestion, Website related queries, Others) then you can make a complaint against it, the only thing you need to do is sign up at official website of Election Commission of India if you are new user else you can directly login to your account can raise a complaint over there. How to Complaint on Voter Id Card ? You may proceed to register once filling up the fields mobile number, Captcha & email ID field is not mandatory if you have an email you can fill up else can leave this field. 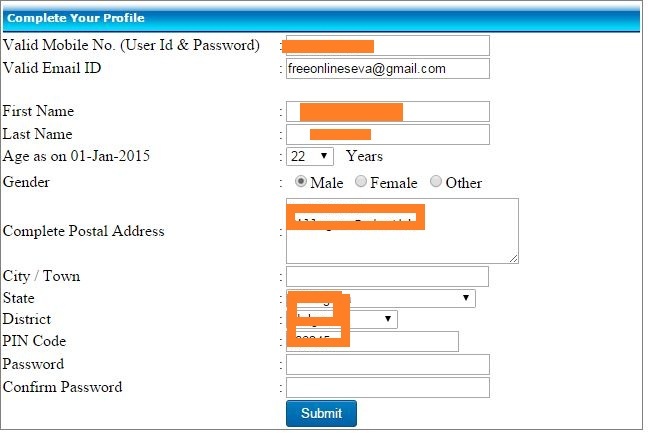 In next page you can fill up your personal information to create your profile also you need to set password. Now you will be navigated to your account. Follow below steps you can create your profile. Remember User ID and Password for Next time Login it will help you to complaint about Voter Id Card and check Status of your complaints. Give user ID as your registered mobile number, and the password you have set for your profile. Choose your state,district,assembly constituency,category and give a subject. In next field you can give brief description about your complaint. You have a chance to upload any photo regarding your complaint. Now your complaint registered successfully. Citizens can also call the Voter Helpline, the number is 1950 (add your STD code before dialling). Now any citizen from any part of the country can call on the toll-free in Hindi or English with any complaint or query at any time of the day. Callers can esquire on subjects such as elections, dates, voting, EPIC, electoral roll, online registration and lodge a complaint by simply dialing into the toll-free number Not only this, executives also make outbound calls for educating the electors and spreading voter awareness. NO PROPER ANSWER FROM ECI..MY VOTER ID IS PENDING SINCE 5 MONTHS..NO PROPER ACTION YET. Sir, My aunt whose name Ramakanta my voter id has not issued .My aunt age 40 years old.I already applied for it many times but nothing I get so plz issued my voter Id proof..
MY ANTI WHO IS40 YEARS OLD BUT VOTER ID PROOF HAS NOT ISSUED YET I APPLIED FOR IT BUT ALL USELESS SO PLZ ISSUE IT..
SIR MY NAME IS ATUL MALIK. I APPLY LAST YEAR ARIL MONTH AND VERIFICATION DONE IN JULY AND AFTER THIS I HAVE NOT RECEIVED MY VOTER ID. MY APPICATION ID IS 7471128. PLEASE HELP ME.